Researchers will start excavation work to completely uncover an underground city located in northeast Turkey's Bayburt province, according to Bayburt Director of Culture and Tourism Bekir Kurtoğlu. Initially discovered in 1999 during construction work, researchers first found around 20 rooms with 2-meter-long ceilings in the underground city. Researchers concluded that the rooms were built solely by carving rocks without any additional construction materials. Soon after, it was realized that the rooms were not the only underground structures as archeologists also found tunnels running underground. 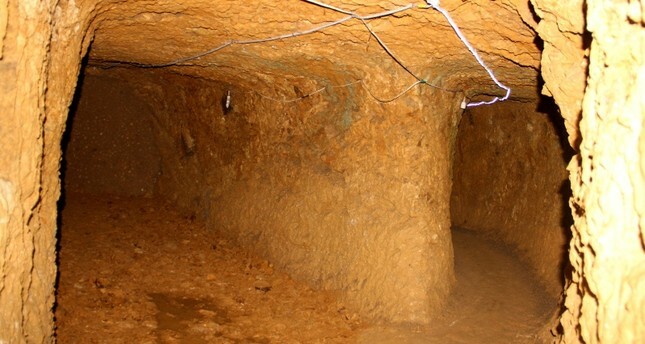 Around 1,200 meters of the underground tunnels have been excavated so far but it is believed that the tunnels run as long as 7,500 meters, running from Bayburt Castle to Kırzı town. In an effort to uncover the remaining parts of the underground city, officials have drafted a restoration project to fully discover what lies beneath. The officials will make use of ground penetrating radars (GPR) in order to map out the underground tunnels precisely before proceeding with the excavation. According to Kurtoğlu, around 40,000 people have visited the underground city, which is believed to have been used as a shelter by people fleeing colony wars during the Roman Empire. During the late Middle Ages, Bayburt was a stronghold of the Genovese and its strategic location between the Empire of Trebizond in the Black Sea, and Persia boosted its prosperity in the 14th century. Other historical landmarks in the city include a 12.3 acre ancient site, tombs, mosques, baths and the Baksı Museum. Famous Ottoman traveler Evliya Çelebi and Venetian explorer Marco Polo are believed to have visited Bayburt in the 16th and 13th centuries, respectively.